Last Sunday was another great day to have a combine, and a wide variety of athletes all across the state of Georgia traveled to Rabbit Hill Park to compete in our Gwinnett Combine. We have already sent off the combine results to each individual athlete via email, and will be setting up profiles shortly. So with no more introductory talk, here is the top players for each data set at our Gwinnett Combine. Scroll down to the very bottom to see our Upperclassmen, Underclassmen and Overall combine MVP. 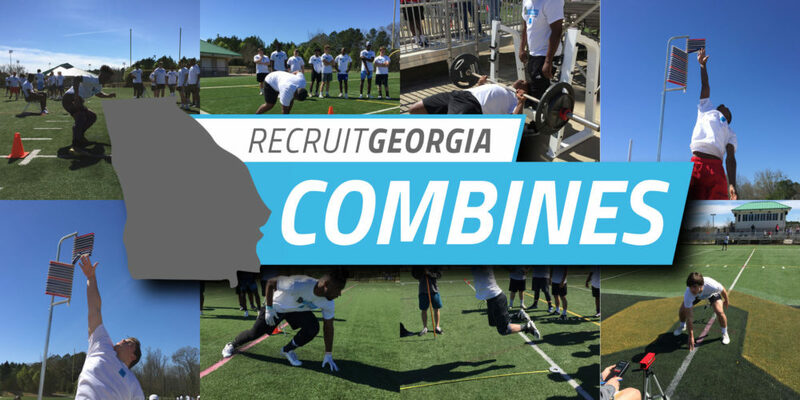 For more information about the Recruit Georgia Combine Series please click HERE. Rivera ran the fastest time, and was probably the most explosive player at the combine, which is incredible when you take in account that he is a kicker by trade. The 2020 recruit’s longest kick of his HS career so far is right at 48 yards at the NAAPS All-American game. It’s rare to see a kicker with this type explosiveness, and his upside at the next level is obvious. Just watching his film from last season, you can see the 2020 recruit send the football back deep into the endzone with regularity, and he looks to be a hidden gem among specialist in the state of Georgia. TOP DOGS – Dwayne Johnson, a rising junior linebacker from South Gwinnett, and Elijah Ruiz, a rising sophomore from Gainesville both measured out to be the two tallest players at the combine. Johnson’s measurement is an inch taller than he even expected, as he list himself as 6’3″ in our database. The 2021 linebacker shows a ton of promise using a unique blend of agility and size to line up his tackles. Ruiz appears to be the next bookend OT at Gainesville. The rising sophomore offensive lineman will have an opportunity to get playing time this fall with SR Damon Mixon graduating. TOP DOGS – The Greenbrier rising sophomore’s 8’5″ standing reach puts him near the top of any player from our combines so far. He is just starting to fill out his frame, but with his length and good explosive step, Driskell is a player to keep an eye out next fall to see if he cracks the varsity. Justin Jones is the top dog among upperclassmen with his 8’3.5″ standing reach. With that sort of length Jones was lined up at LT last fall for Rockdale County. He gets pretty good leverage, and keeps a nice flat back while blocking. The rising junior measured out to be 6’3″ and right at 230 lbs. A little more time in the weight room, and Jones should be close to 250 by the start of the 2019 season. TOP DOGS – Ashlon “AJ” Williams takes the highest vertical of the day, and the top spot of the combine series so far, which is out of 180 players at this poitn. His 35.5″ vertical jump is impressive for a 6’1″ 206 lbs athlete. Not listed above, but ranked top among the underclassmen is Greenbrier rising sophomore QB Brooks Pangle. He scored a 30″ vertical, which was a .5″ advantage between him and Kierre Conley Jr, a rising sophomore out of Woodland. TOP DOGS – This was a tightly contested drill, but Christian Rivera, the combine event’s fastest man lands a 9’7″ broad jump. It’s another explosive eye-raising score for the class of 2020 kicker, which ranks him near the top of any participant at our combines. Ashlon Williams’ 9’6″ broad once again shows off his explosiveness for a player his size. There was a 47 lbs. difference between Rivera and Williams, and only one inch of separation between their scores. Following right behind is Seth McClure and Jalen Henderson with very good scores. Rising sophomore Davin Driskell is starting to become a familiar name, his 9’4″ broad jump gave him a 5″ edge on the 2nd closest underclassmen, fellow teammate and rising sophomore Brooks Pangle. TOP DOGS – Jackson Canup closes out the top shuttle spot after finishing 2nd at our Jackson Co. combine. The 2020 Hart County recruit shaved off his score of 4.34 to a 4.16, which gives him the quickest shuttle time of any combine series participant. Canup plays off the edge at Hart County where his outstanding quickness allows him to get around blocks regularly. Following behind Canup was a long list of athletes who were just milliseconds away from one another. 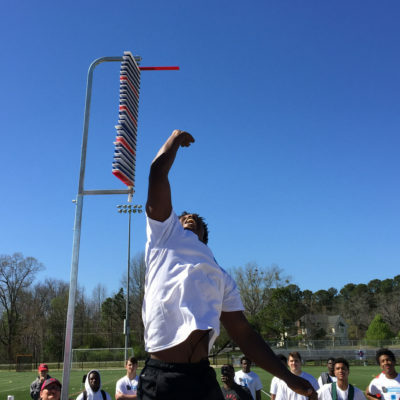 Of note, Xzavier Ward, a Peach County senior who measured out at 6’3″, and Dwayne Johnson, rising junior from South Gwinnett who tested at 6’4″ made the list with the smaller skill athletes. Brooks Pangle’s 4.43 was the best of any underclassmen with Shaun Williams out of Peachtree Ridge just behind with a 4.46. TOP DOGS – Seth McClure obliterates the combine record held by Kale Gibbs (6.97) from LaGrange by almost .3 of a second. McClure’s 6.69 time indicates elite quickness that very few athletes at any level can boast. Jackson Canup also breaks the combine record with a 6.96, but it was McClure’s elite score that stole the show that day. Brooks Pangle once again finishes at the top of his underclassmen group with a 7.26 time, which edges the 2nd closest score by .12 of a second. TOP DOG – Cimino showed off very good endurance bench repping 185 lbs. 22x. The 6’2″ 261 lbs. rising senior from Denmark HS tested out to be the strongest man at the event. On film, he gets a solid initial push and uses his powerful upper body strength to get defenders off balance. This was a tight group of athletes with upperclassmen dominating the list, but Cimino claims top dog on the bench. TOP DOG – Elijah Ruiz takes the top 135 lbs. bench rep total with 18 big ones. The 6’4″ 250 lbs. rising sophomore already has good upper body endurance, and with a such a high rep total, he could have also competed at the 185 level too. The 2022 recruit is a very promising athlete, early HS film shows an aggressive mindset, several pancakes. As mentioned earlier, we are extremely interested to see if Ruiz is ready for varsity reps next fall. The rising sophomore really showed off his upside in Gwinnett standing nearly 6’4″ tall, and testing out with some of the best scores among any athletes at the event. He benched 185 lbs. 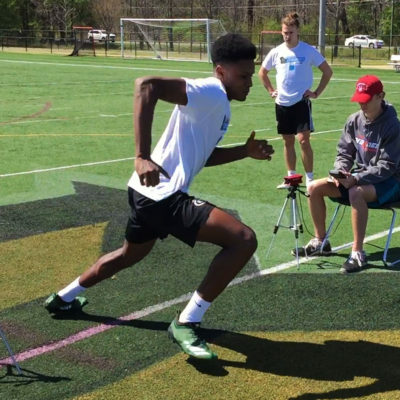 10x, ran the 2nd fastest 40 time among underclassmen, and his 9’4″ broad jump is outstanding for a player his age. Driskell should continue to grow into his frame, and with his explosiveness, his upside to play big time football is legit. Considering his 8’5″ standing reach, you could see Driskell continue to grow up, and potentially be over 6’5″ later on in high school. The Greeinbrier rising sophomore is one to target for the remainder of his career. His teammate Brooks Pangle is a close 2nd with Elijah Ruiz out of Gainesville and Kierre Conley Jr from Woodland also testing well among their class of 2022 age group. AJ Williams proved why FBS schools from all around are looking at the 2020 linebacker/running back. He measured out at 6’1″ and 206 lbs. and showed off his explosiveness when he set the combine record with a 35.5″ vertical jump. His 9’6″ broad jump ranked 2nd, and places him in the top 5 among all combine participants this offseason. Williams repped 185 lbs. 17x showing off excellent physical endurance. The Elite GA Classic participant holds an offer from Navy and also getting heavy attention from Army and shortly after our combine, he was contacted by Memphis, and will be visiting very soon. The rising senior from Aquinas had 90 tackles last year at his OLB spot and also rushed for 754 yards too. His explosive scores are impressive, and with more work in the weight room, we can see Williams edge closer to a 40″ vertical. 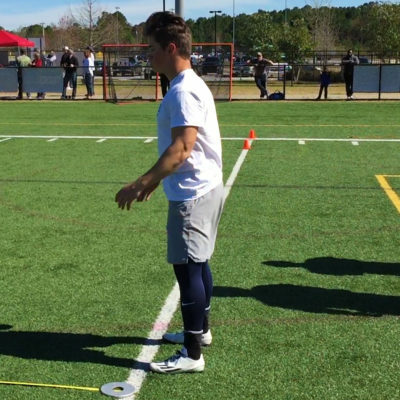 Georgia Force kicker Christian Rivera is a close 2nd to Williams, and any school that is looking for a specialist, needs to seriously consider the explosive athlete. Seth McClure’s 6.69 L-Drill time is just downright nasty, and that score alone almost wins him the Overall MVP spot. For context, at the 2019 NFL Combine, McClure would have scored the 4th fastest time out of all the participants. The home schooled all-purpose back for the Georgia Force also scored in the top 3 in 4 other drills as well. His 20 reps on the 185 lbs. bench makes him pound for pound the strongest athlete at the combine. McClure is a stout 5’9″ and 182 lbs, he showcases skills at both running back and at slot receiver. For this offseason, he should go all in as a slot receiver, his elite quickness when coupled with more polish as a route runner would give opposing defenses nightmares. High academic schools will be pleased to know that McClure sports a 3.94 GPA and has tested out with a 24 on the ACT and a 1180 on the SAT. In 2017 he was nominated by the North Georgia Touchdown Club as Underclassmen of the Year and participated in the NAAPS All-American game in 2018.